"Never give students chairs on wheels - they go bananas" noted a teacher to me recently. Actually, surprise surprise, I wholeheartedly disagreed. I've introduced seats on wheels in some very difficult schools, and whilst there may be a little over excitement at first, the novelty of wheeling around soon wears off for the vast majority. Students really do appreciate professional office standard furniture in the correct place. And different places in schools require a variety of FF&E (furniture, fixtures and fittings) for them to work efficiently. We expect students to sit for vast amounts of time - for all sorts of well rehearsed reasons they need to have effective ergonomic seats that are appropriate for the activities underway. 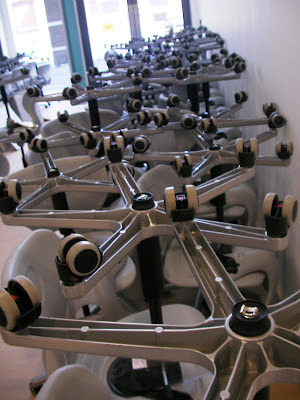 Actually if we are really expecting students to be collaborative, work with each other and move groups, wheels are precisely what they do need, rather than have students carrying chairs, with legs at eye level around the place. The days of the very cheapest moulded chair with no 'give' in them have surely gone as we re-equip schools today. There are still too many of them in existence and ... boy - are they uncomfortable. No wonder students sitting on them fidget! 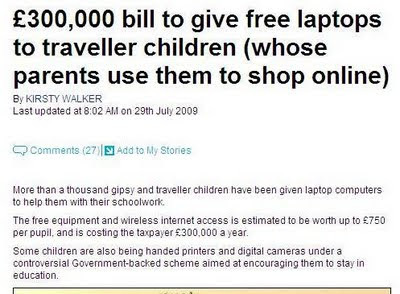 A colleague referred me to a story today in one national newspaper concerning the children of some travellers being given free laptops so that they can engage and continue with their learning whilst 'on the road'. Obviously some form of connectivity is required so they are also given 3G devices, which seems really sensible. But whats the news here? It's not new - its been running for years. Lots of authorities all over the UK are now moving to wards a handheld device for every child. This allows the desire for 'anytime anywhere' learning to be achieved. I really believe that the children of travellers should have the same opportunities, and if they increase levels of education through the use of ICT, which for some have been notoriously low, then so much the better. The headline makes a bit of a fuss about parents using them to shop online, but if all the family get increasingly ICT literate, isn't that a good thing? Does it matter? (And hopefully younger siblings are also using them and getting increasingly IT literate.) How many homes have computers for the exclusive use of one person? Experience clearly shows that fathers get more involved with their child's education if I.T. is involved. Young people are often the ones acting as teacher, showing parents how to use new technology - even better. The children of travellers have a right to education - if they are not attending school through no fault of their own, then they must have something - and this seems to be engaging them. The use of technology to do this is just so obviously the right thing to do. Good move really. ..... and if Swine Flu really does close schools next academic years as some fear - on-line learning is really one route that should be explored more! It is the way forward - we all know that. 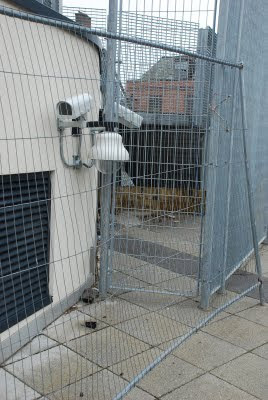 Although protected by temporary fencing, these cameras look anything but short term fixtures. Located outside a new London secondary school that is open and working, I cannot think I have ever seen such low slung cameras, just about four feet off the floor. I must admit I did not ask whilst I was there visiting, but I can't help but wonder whatever use they will be once their 'protection' has gone! This is possibly the most bizarrely situated camera array I have ever seen, especially in a school. Presenting the key note presentation to the Yorkshire and Humber Grid for Learning Conference with a colleague recently, we focused on innovative learning environments and the role of integrated ICT. The reception and interest was high and delegates were literally saying how excited they were with the opportunities that BSF would bring their respective regions. they are right to be so excited - if done properly, the potential for students and staff is great! The key, of course, is to learn from all those projects that are already underway and incorporate lessons learnt into their own submissions and planning. There was considerable agreement when I really stressed the critical importance of the early implementation of an education transformation programme. This is something that even now, amazingly, not everyone is doing. I really enjoy speaking at events like this - the reaction, interest and feedback we receive is always interesting and helps form my views and opinions. It was exciting to see so many engaged with making learning opportunities better for students and wanting ot learn from others. Just great really! Watch out - nettles about! An innocent enough picture - children playing happily in the grounds of a hotel during a family wedding. They were having exploring, creating, being imaginative and just having fun. It was great to watch. They were also learning, research and sharing as they talked about how the bridge got there, why it was there and so on. It's just a pity that, of the teachers present, just how many muttered things about 'health and safety' and that they could never bring a school trip to this very natural environment. There were after all, stinging nettles, running water, the 'bridge' of railway sleepers had no railings, there may be 'odd bods' (not their words) lurking in the trees and no one had done a risk assessment. They were joking about it, but were also sadly serious about the message. I just think that we really have gone too far in many ways on health and safety. It is bonkers to read about staff banning trips, or having to wear goggles to use blu-tak, or read a five page instruction booklet before using glue sticks. Staff are in a real predicament - they want to do these things but now cannot afford for anything out of the ordinary to happen and definitely not an accident. The blame (and litigation) culture has spoilt lots of these activities for students and the staff who used to enjoy running them. Having said that, as a parent, I would not want anything to happen to my daughters. But there must be a balance somewhere - surely? Not a school and I know it seems to be unfashionable to like iconic buildings these days, but I do just love the Hilton Hotel / Apartments in Manchester. 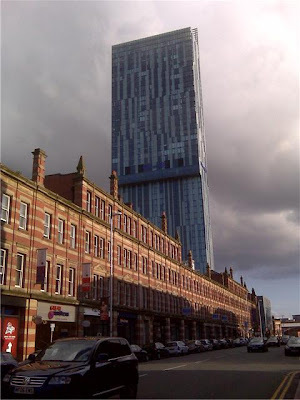 I spend a of of time in Manchester at the moment. No matter where you are , or how you drive towards it - there it is. The jutting out glass floor of the bar half way up the building always makes people wonder if the building will stay upright. You just have to engage with it. There are times when it IS appropriate for schools to be of iconic design within their own communities, why shouldn't they? There are lots of people who want schools to really resurrect community cohesiveness and become the central hub for the area used by everyone. They have to be exciting, attractive and inviting. I really don't agree with those folk proposing that we should use one of a limited number of standardised designs. Each community has its own uniqueness, which their schools should reflect. It is not like building an identical branch of a furniture showroom or a DIY warehouse. Whatever the external views, it is the learning spaces inside that are most important though. There is no point having an exciting exterior if the inside layout does not maximise opportunities for the full range of learning styles in agile and adaptable spaces. Learning is changing faster than the buildings - the agility is essential. We know all the ingredients for how to design such spaces, it's a matter of incorporating them into a pattern that meets the vision of the school. There are some really exciting learning spaces being built now, often that have had considerable student and community input into the design. Immediately there is increased ownership and engagement with the building as a result. They want a building in their community that they can be really proud of and that offers a full range of services to enhance their community. Why shouldn't it look fab as well! I was flattered to be invited to contribute as a 'witness' to the Teaching and Learning Expert Seminar yesterday in Birminghame as part of the BCSE Great Schools Enquiry. Chaired by Baroness Estelle Morris, every effort is being made as to identify what makes a great school and at the end make appropriate recommendations. A panel of just ten of us, representing a number of backgrounds, responded and shared views on issues about learning and teaching, great schools and the impact of environments, in the session cleverly chaired by Jenny Thomas of BCSE. Whilst I deal with these sort of issues regularly, it was really refreshing to be able to just sit and share/discuss views in a totally professional dedicated format for a long period of time. Having the time to do this really makes a change from a really busy life and was one of the best professional discussions I have taken part in for ages. A number of panels are taking place around the country. There are also other sessions taking place as a public event. All the evidence will contribute to the larger enquiry. 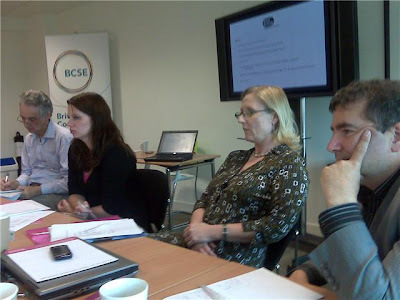 For more information visit the BCSE website. Lots of people have lots to say. With real evidence presented, this could be a really powerful enquiry. Many have have high regard for Estelle Morris - I look forward to the final report which is due, I believe, very early next year. I was asked this week what I thought technology in schools would look like in the future? An impossible task really. 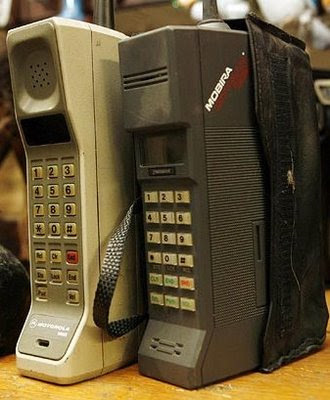 Goodness, people just a few years ago thought mobile phones would never take off due to their enormous size. Look at their vast computing power now. What we can safely predict is that everyone will have their own dedicated high quality device - many schools are heading that way already. They will be able to log in anywhere, anytime and work and communicate locally, nationally and globally. I was pushed as to whether that meant everyone just having a laptop - my answer is no, I am sure it will be a range of devices - it's just that we may not have seen them yet. This is the key reason why new learning spaces have to be so carefully configured to maximise agility in learning, be adaptable for the widest range of learning styles and have fully integrated technological capacity. All this has to be able to proactively adapt to whatever the future brings. This is a real challenge for many teachers, especially those in very demanding schools. Preparation for this is long term and very much a 'journey' (even though I hate that phrase) and cannot be something just 'shoved on' in an evening session or one professional day. Most staff I still actively work with really like to see ideas for the future, but then also want to see how it works in their own room, with their students, on the real work that has to be done with all the challenges of results driven, inspection driven, National Challenge demand and and and and.. Many tell me that they consider the most effective form of professional development occurs when people are modelling, coaching and supporting staff in their own classrooms. This is really effective but cannot just be a brief 'one-off' visit. It is about developing confidence, skills and ideas and having people to praise, help plan and suggest 'alternative routes' when learning goes in a different directions. 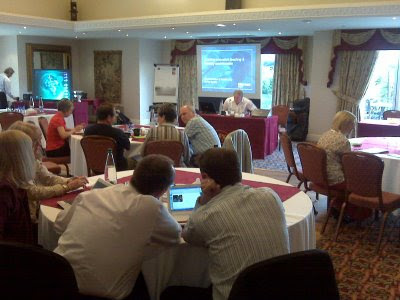 They also want time to plan, evaluate how things went and share experiences and ideas to move forward. Developing teams of people confident in new strategies is the way forward. Funding models often do not allow this currently and the whole approach to CPD just has to be reviewed. Even in BSF, there are budgets for everything, buildings, ICT (equipment and training) but no budgets are specifically identified for education transformation CPD - the people bit (except whatever funds can be spared from the ICT budgets but it is so much more than just that). New buildings do not bring about education transformation - but they can really enhance the opportunities if people know how to respond to them. If we get this wrong then we are not encouraging the long term transformational agenda? We need a rethink!